Middle - Upper Jurassic, approximately 164.7 - 155.7 million years ago. Location: La Matilde Formation, Cero Cuadrado Petrified Forest, Patagonia, Argentina. Araucaria mirabilis is a species of extinct coniferous tree from Patagonia, Argentina. It belongs to a sub-genus of Araucaria called Bunya. Its closest living relative is Araucaria bidwellii, which is found in Australia. This specimen is from the Cero Cuadrado Petrified Forest, in Patagonia, Argentina. During the Middle Jurassic (approximately 160 million years ago) a volcanic eruption buried the forest. The petrified forest contains large amounts of well preserved silicified wood and cones, including tree trunks that were eleven feet in diameter and reached 330 feet in hight in life. The cones, from this area, average between one and three inches in length and have an elliptical, ovoid, or spherical shape. The seeds of the cone, are found under each of the cone scales. Araucaria mirabilis shed only the seeds at maturity, but not the scales of the cone. So, the scales would open up and the seeds would drop out. Individual cones from this area are not uncommon. Cones attached to the branch are rare. Two cones attached to the branch are very rare. Three cones attached to the branch are extremely rare. The cones, for this branch, were found with the branch and had to be reattached. 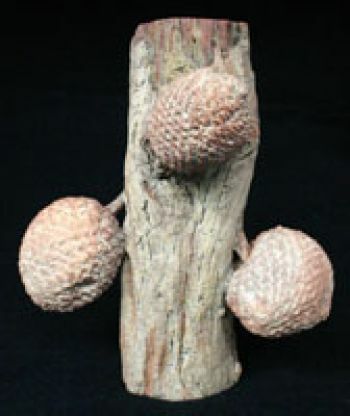 The cones, stems, and branch are all original specimen material from which this cast was made. Current day relatives of this genus include the Monkey Puzzle Tree and the Norfold Island Pine. They grew in subtropical mountain forests and currently grow (naturally) only in the southern hemisphere. Kingdom: Plantae, Phylum: Pinophyta, Class: Pinopsida, Order: Pinales, Family: Araucariaceae, Genus: Araucaria, Species: mirabilis. 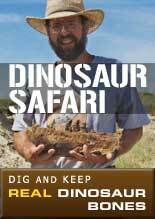 Exporting of all fossils from Argentina has been banned since 9-15-2003. The original branch and cones, from which this was cast was made, was collected and exported prior to this time. Once the existing supply (specimens exported prior to 9-15-03) is exhausted, you will only be able to purchase original specimens from private collections, Hopefully, museum quality replica specimens, like this one, will always be available. The original for this specimen has been valued at $3,000.00! This specimen is cast in solid resin and has been weighted, giving it the feel of the original specimen. 8" x 6-3/4" x 3-3/4"